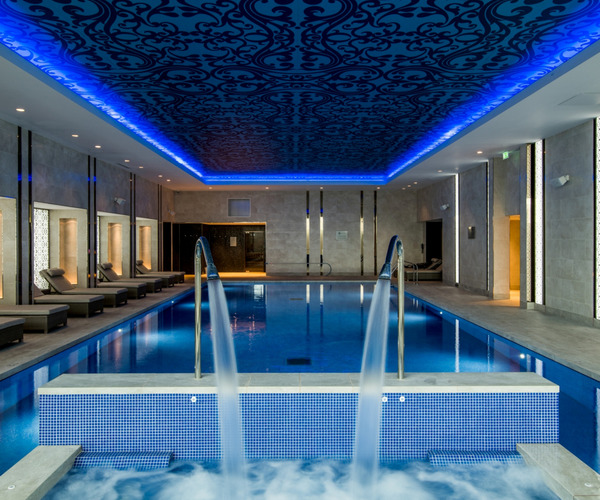 The Spa offers a luxurious and holistic approach to wellbeing with its state-of-the-art facilities, acclaimed treatments designed by ESPA and a team of professionals who deliver them. It draws its aesthetics from its location in Greenwich, featuring bespoke mosaic tiles, sumptuous rugs, delicate die-cut pendant lightings and other exotic materials inspired by the area’s rich maritime and trading history. In addition, The Spa has been designed to include exotic textures and luxurious materials such as gold gilt and blue pearl granite as well as heavy timbers inspired by Greenwich’s historic naval ships and merchant dock yards. The Spa has been designed to include exotic textures and materials such as gold gilt and blue pearl granite as well as heavy timbers inspired by Greenwich’s historic naval ships and merchant dock yards. Treatments are by ESPA and facilities include a steam room, sauna and ice fountain. Enjoy a vibrant mix of destination restaurant and bars at the InterContinental London – The O2. With our Tea salon and comfortable lounge, fine dining and all day dining or our glamorous rooftop Sky Bar for a fantastic range of cocktail’s served in view of the dramatic London Skyline. Each restaurant and bar takes inspiration from local Greenwich markets and its historic maritime heritage, including the Meridian Lounge, Clipper Bar and luxurious Peninsula Restaurant. Our luxury InterContinental London – The O2 boasts 453 spacious bedrooms and suites in contemporary design with an abundance of natural light from floor-to-ceiling windows. Experience the opulent yet contemporary style of one of our 50 exclusive suites, each offering premium comfort and space in the heart of London’s most vibrant entertainment centre.